From time to time, Anathoth Farm holds competitions and promotions where Terms & Conditions apply. Each competition will be open only to New Zealand customers (unless specified otherwise) due to prize availability and dispatch channels. This, along with dates of promotion, details of contents and value of the prize pack will be specified for each competition below. Open to New Zealand residents with a New Zealand delivery address, who are current subscribers to our e-newsletter. 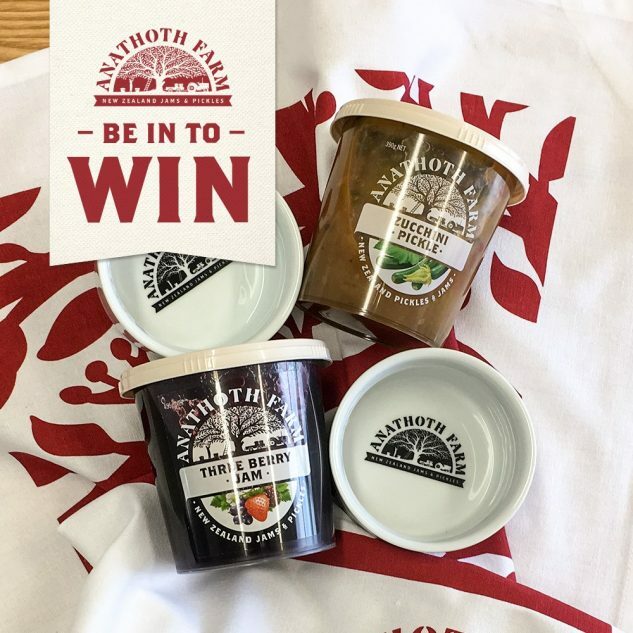 To enter, email jammaker@anathoth.co.nz and TELL us how you’d use your Anathoth Farm goodies with the festive season fast approaching. Prize details: 10 x packs up for grabs. Each pack contains 2 x Anathoth Farm preserves, 2 x ramekins and a tea towel valued at RRP$25 each. Winners will be drawn at random by judges from Anathoth Farm. No correspondence will be entered into. Dates: Opens 5 November 2018 10am, Closes 14 November at 11.59pm, and drawn 15 November 2018 at 10am. Winners will be advised by email then announced shortly after on social media and on this webpage. Employees of Anathoth Farm, immediate family members thereof, and employees of the agencies involved will not be permitted to participate in this contest. The Organisers will contact the winners via Facebook or email to arrange for prize delivery after the promotion is over and the winners have been determined. If the winners do not contact or reply within two working days, the Organisers have the right to choose the next available winners without any prize replacement to the original winners. Winners must have a New Zealand delivery address (or as specified). The Organisers reserve the right to disqualify all entries that are deemed to be inappropriate or offensive to other users. The Organisers reserve the right to withdraw competition or amend dates if required. Judges’ decision is final. No correspondence will be entertained. Winners names may be published on our website and via social media channels. Anathoth Farm competitions have no affiliation with Facebook. This competition is run by Anathoth Farm who may be contacted via email here. As a condition of participating in a promotion, the winner indemnifies the Promoter, all organisers, sponsors and all other persons and organisations associated in any way with that promotion against all claims, damages, liabilities, costs and expenses (including legal fees on a solicitor and client basis) which the Promoter may incur arising out of the winner’s participation in the Promotion and/or participation in a prize, howsoever caused. August Photo of the Month *Major: @findingmyway_home* Minor: Teresa Higginson (FB), Claire Butler (FB), Debbie Martin (FB), Marina Robertson (FB), Jessica Mondia (FB), Helen Tam (FB), Kate Rassie (FB), Andrea N Fry (FB), @prepbygeorgia (IG), @the_macpherson_diairies (IG), @becs_nic (IG), Stacey Alice Reeves (FB), Suzannah Newton (FB), Debbie Snell (FB), @jes122582 (IG), @whats_for_smoko (IG), Jenni Chong (FB), Tabitha Hinewai (FB), @sweet.bix (IG), @hungry.nutritionist (IG).